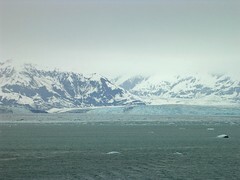 The next day on the cruise (for anyone who's still reading these) was listed as being at Hubbard Glacier from 1-3. 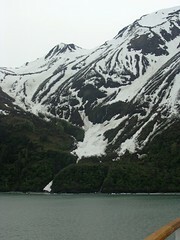 What this really meant was that the ship would sail up close to the glacier, but it was pretty much a day at sea. We took our time getting up, got to breakfast right before it closed, and then hit the HydroSuite for a few hours of aquatic R&R. The aforementioned heated recliners were situated in front of this enormous picture window where we sat and watched the cliffs go by. Still believing we had plenty of time to see the glacier from 1-3, we went back to the cabin, napped, showered, got dressed and watched a little TV, then headed up to the decks to check it out. We ran into Evan's entire family sitting up by the pool, who were shocked to learn we hadn't been outside watching the glacier this whole time and hurry up we nearly missed it. And nearly missed it we had. By the time we got to the top decks, we got a few minutes to check out the glacier as we pulled away from it, and stayed on deck a while looking at the mountains and scenery, when Evan noticed the same waterfall we had seen from the HydroSuite. Had we spent a little while longer there, we would have had the best seats in the house. The rest of the day was rough, sea-wise. It was also the night we had booked the entire group at the fancy restaurant on deck. Our room steward, the waiters, even Hunky Dory had been saying ever since we left Seattle that the worst was over and the sea would smooth out tomorrow. Liars, every one of them. I'm normally pretty steeltummied when it comes to motion sickness and even I had to ask for a Drammamine from the waiter at dinner or I would have lost my filet mignon. Recovery was swift after that, and the night was capped off with some Blackjack and a movie. 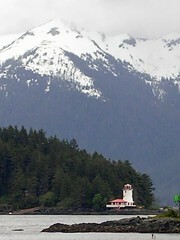 The following day we were at port for the afternoon, in a town called Sitka. We booked a trip called the "Historic Sitka and Nature Walk" which little did we know also included a trip to the "Raptor Center". While not as trendy, scary or awesome as it could be, the Raptor Center is home to birds of prey that have suffered an injury but will never be healthy enough to return to the wild. I was particularly excited to see owls, but they weren't as photogenic as the hawk or the eagles. 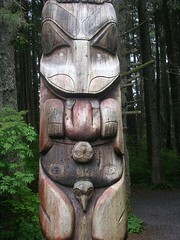 The nature walk took us through this national forest that had some totem poles in it, which were also something I was very excited to see and had been looking forward to. There was this one here that featured a section having something to do with baby-eating, and another that I couldn't get close enough to to get a good picture of that showed a woman standing bowlegged with blood pouring out of her. Menstruation? Adultery? Who knows. 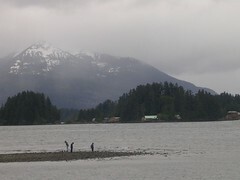 The walk took us all the way from the Raptor Center back to "downtown" Sitka, where we had a little more time before having to reboard the ship so we hit what appeared to be a locals' bar and enjoyed a beer and a few "who the hell are these people" stares, got back on the ship and went to dinner with the clan, and then having spent such a good portion of the day on dry land, felt well enough to stay up for the "Vegas-Style" show, which that night was billed as a dancing comedian whose styles harken back to the days of the Ed Sullivan show (or something like that). What it turned out to be was a guy from Denmark whose strengths in unicycle-riding and plate-on-broomstick spinning way outshined his telling-jokes-in-English weaknesses, and who at the end did this awesome dance routine where he wore a matte black outfit with neon styrofoam piping on it all to this happy house music. I could honestly have watched an entire show of that part.